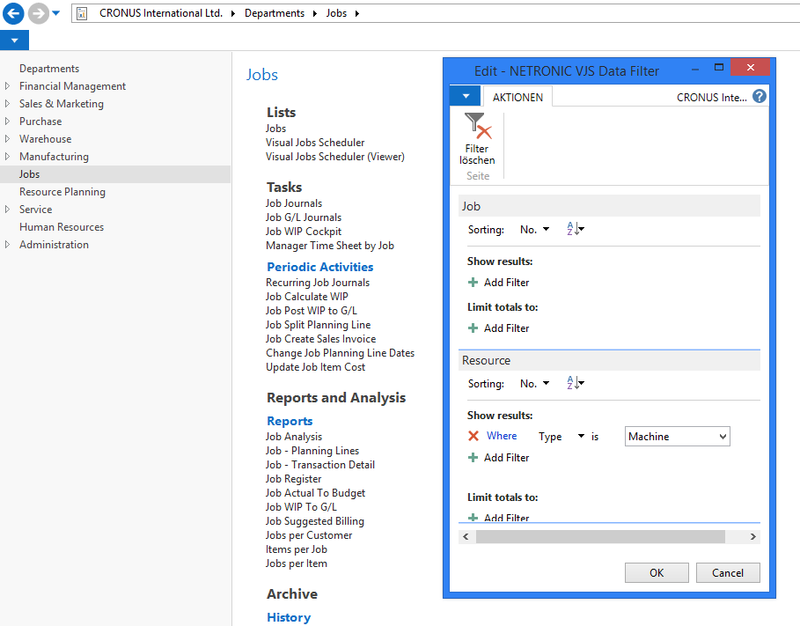 The Visual Jobs Scheduler is an add-in product for users of Microsoft Dynamics NAV. It works as an interactive planning board and visualizes jobs, job planning lines, job tasks, resources and resource allocations. The new version 1.3 (also for Microsoft Dynamics NAV 2016) ships on November 23, 2015, and has been built around enhancing the Dynamics NAV resource scheduling capabilities. This blog post provides you with an overview of the Visual Jobs Scheduler’s recent enhancements like data filters, customization of bar labels and tooltips and much more. If not configured differently (see below) the Gantt chart's bars represent the resource allocation per job planning line in terms of allocated unit of measure. This unit could be working hours, quantities per piece or other measure units. From version 1.3 onwards, this quantity can be edited and changed directly on the bar. The bar length will automatically adjust to the new quantity. 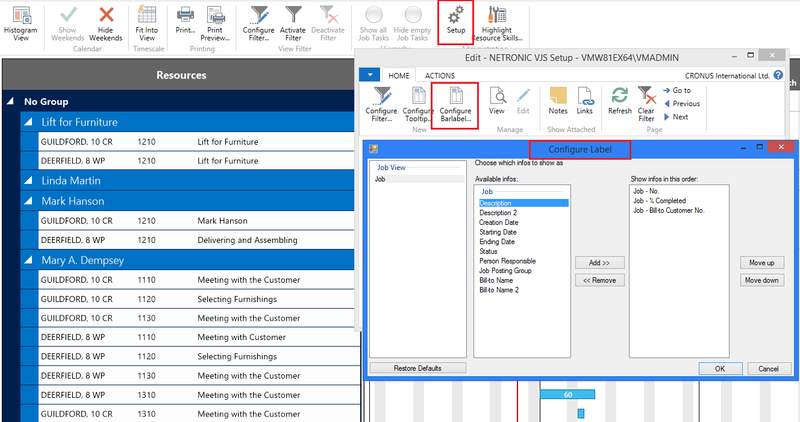 Save Data will store the changes to the Dynamics NAV database. 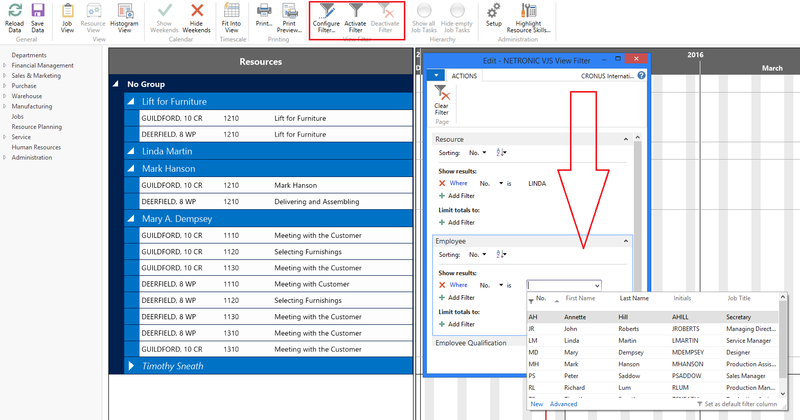 This functionality is a consistent enhancement of the NAV resource scheduling features introduced with the Visual Jobs Scheduler version 1.2 such as showing the "true" duration of a task (as it is indicated by the figure '100' in the above screenshot). 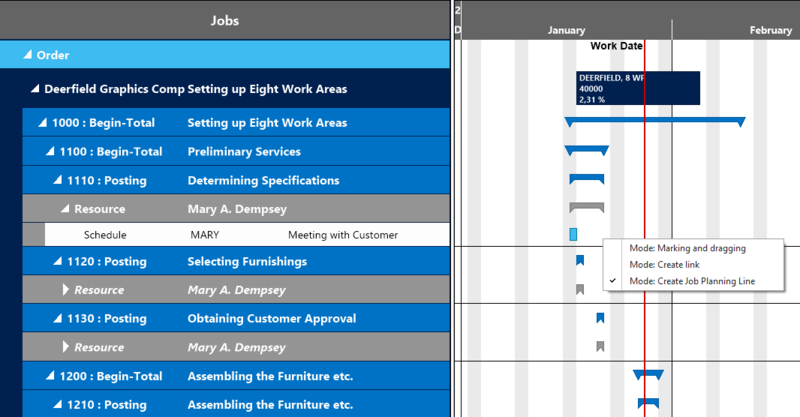 A new mode Create Job Planning Line is available in version 1.3 of the Visual Jobs Scheduler. You can now create interactively a new Job Planning for an existig Job Task of type posting. Create a bar on the same level as a job task posting or resource/item collection. This will open the Job Planning Line NAV page to edit/add data. In addition to the capability to create and split Job Planning Lines, they now also can be deleted. Save Data will store the changes to NAV. Use a View Filter to hide/show only resources meeting certain criteria while the planning board is running. The criteria that can be selected relate to the standard NAV entries in the resource and the employee list. To proceed, configure a filter and activate it. Click the Deactivate Filter button to see the original view. A new button in the icon bar allows to select resources by skills in relation to the standard NAV entries. The resources with the desired skill are then highlighted by a symbol. It is also possible to select several skills. In effect only the resources having all desired skills are highlighted. When the View Filter is activated, you can decide to hide tasks with no content of data by clicking on a button in the task line. Style the VJS in a customized way and show information that are relevant for your customers. There are two new features in the setup dialog: The content of the tooltips can be individually assembled. Bars can be labeled at your choice inside the bar. The Data Filter function reduces the number of loaded resources. This makes sense if there are plenty of resources in NAV that are not relevant for the jobs. The filter appears when starting the Visual Jobs Scheduler. In the setup dialog you can switch off the data filter. What to see the new functions in action? Schedule a demo.